Through exhibits and events, Cities Methodologies draws together undergraduate, masters, and doctoral research, alongside work produced by academics, and the wider community of urban researchers. Those involved are developing and using innovative methods to understand cities and urbanization. Cities Methodologies aims to promote cross- and inter-disciplinary work, and to showcase recent research on a wide range of cities. Visitors to Cities Methodologies encounter diverse methods of urban research in juxtaposition‚ from archival studies to statistical analyses, practice-led art and design work to oral history, writing, walking, film-making and photography. 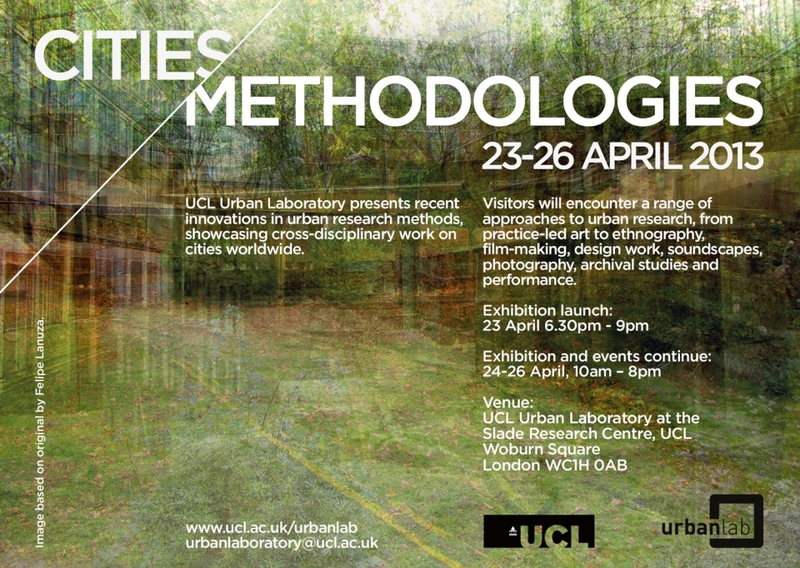 The UCL Urban Laboratory community is delighted to present the 2013 edition of Cities Methodologies, an annual exhibition and events programme showcasing recent innovations in urban research methods and cross-disciplinary work on cities worldwide. 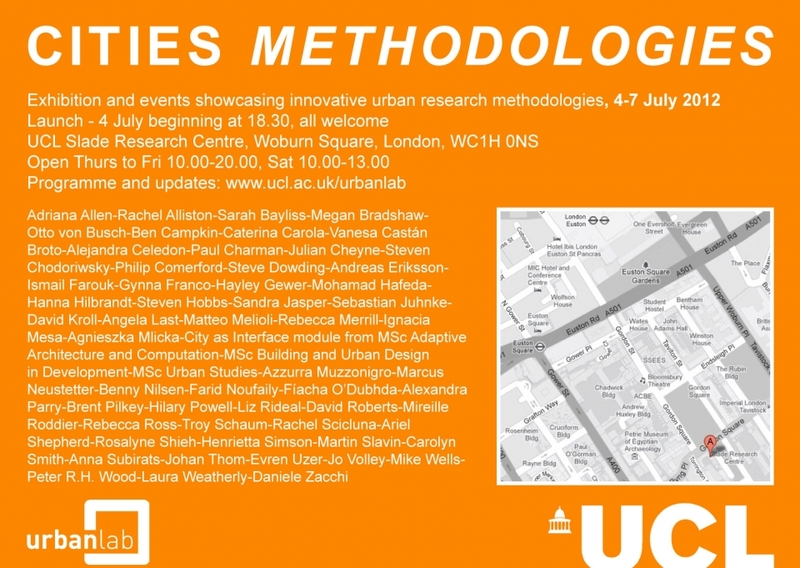 From the start, five years ago, Cities Methodologies has been a pan-UCL cross-faculty initiative and we are pleased to once again be able to hold the exhibition in UCL’s Slade Research Centre, Woburn Square. Previous shows have also travelled further afield, most recently to Bucharest in 2010. The exhibition and events feature work by undergraduates, masters and PhD students as well as academic staff and the wider community of researchers and practitioners developing new methods to tackle urban questions. We welcome you to participate in the exciting programme of talks, screenings, workshops and launches that accompanies this year’s diverse array of individual and group exhibits. In each gallery space visitors will be exposed to different methods of scrutinising the city and processes of urbanization, including practice-led research from art and architecture, ethnography, film-making, graphic design, soundscapes, photography, archival studies and performance. All events are open to the public and free to attend. No booking is required. 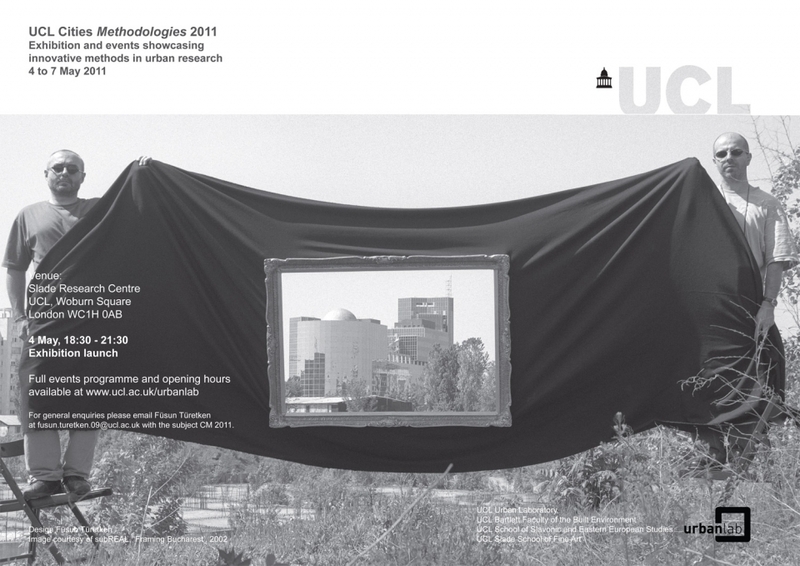 Masters and doctoral students from the UCL Bartlett School of Architecture MA Architectural History module Theorising Practices/Practicing Theory: Art, Architecture and Urbanism have produced an exhibition of site-writings that open out into a performative display of site-readings. Join the students and visiting critics throughout the day for presentations and discussion of the exhibition. This project explores the spatial, social and cultural dimensions of Urban Prototyping by connecting urban screens in four locations (two in London and two in Nottingham), exploring how this medium can enable participation in the urban environment. Katharine Willis, Lecturer in Architecture at Plymouth University, will investigate the impact of social networks on public spaces. Her work focuses on the emergence of hybrid neighbourhoods, new types of spaces which will be explored and reviewed through some current empirical work. What is the logic of the planning process in contemporary Moscow? How is it informed by traditional sociological methods? In this talk and Q&A session, we will use an experimental study conducted in one of Moscow's courtyards to discuss the challenges of a participatory design process in post-socialist cities and the methods which inform it. A behind the scenes look at the materials, methods and stories Hilary is working with to construct a book of hours based on the changing fringes of the London Olympic Park. The project explores the process of working in direct collaboration with the materials of these sites (from roofing zinc to London brick stock) to experiment with and reinvigorate the traditions of etching and pop up book construction. A review of the latest photographic research project by the artist's alter-ego (the paranoid photojournalist Adam Walker-Smith), illuminating some of the extraordinary methods that he used to identify and document plants he suspected as being part of the high security apparatus found in London's secure financial and commercial spaces. Looking at an inner courtyard that now wants to become a public piazza, we will try to understand a Social Movement and the wider process of the Struggle for Housing in Rome deconstructing its space and everyday life. In so doing, the talk will discuss the conditions of possibility for an archaeological approach to the study of the built environment. This "critical poetic reading" of Beirut traces a week-long research immersion into the conflicting politics, visions and approaches to urban development in a still on-going post-war reconstruction context. A showcase of collaboratively produced artworks from Andrew’s sensory ethnographic fieldwork exploring place making amongst new arrivals in a city. This talk will explain a series of diagrams that illustrate the construction of spatial scarcity in informal settlements and how these diagrams can be used as analytical and projective tools to reveal spaces for change and creative intervention. 7 pm: Gynna Millan and Juraj Rutsek - Whose Olympics? An exploratory project carried out during London 2012 to record transformations in open spaces and citizens' experiences as a result of the Olympic Games. During this talk, the team will present how video was used as a methodology for urban research as well as sharing some original footage that is part of the forthcoming documentary Whose Olympics? Film screening followed by Q&A: House is a 20-minute video projection that explores aspects of what the house means to us today, using the example of a derelict Georgian town house in Marylebone. The exhibited pieces are palimpsests that represent the Heygate as an absence by over-layering its different times. Here, absence embodies multiple and simultaneous presences situated at a distance, creating an alternative vision for the vanishing Heygate Estate while interrogating the processes of urban renovation. Starting from a design for Grand Paris, this is an experimental artistic and academic project which combines creative inputs and formats with transdisciplinary theoretical and critical thinking, organising them in a conceptual model of the urban galaxy in order to design a future strategy for the extended urban area. Michael examines the methodology of the urban climate map, connecting meteorological observation and modelling with real-world urbanism and the complex microclimate of urban streets, illustrating a method that is up-and-running in several cities world-wide, but unaccountably missing from mainstream literature on urban climate change. A cross-disciplinary conversation about participation focusing on a selection of projects in progress by doctoral students from the Bartlett Faculty of the Built Environment (Architecture, the Development Planning Unit, Planning) and affiliated with the UCL Urban Laboratory, including members of the recently formed Participatory Activist and Research Network (PARN). astate is a continuous public meeting presented here as a series of conversation-events, films and workshops. A round-table discussion on themes of heritage, memory and the archive, focused around the three presenters’ (Richard Dennis, Carlos Galviz and Sam Merrill) research on and participation in the ongoing commemoration of the 150th anniversary of the London Underground, with contributions from guest discussants including Sam Mullins (Director, London Transport Museum) and David Lawrence (Senior Lecturer in the Faculty of Art, Design & Architecture, Kingston University). The exhibition explores the changes – and the non-changes – that a heritage village in Chile, San Lorenzo de Tarapacá, has experienced since a large earthquake affected it in 2005. Photographic records from different historical periods are juxtaposed, aiming to reveal sometimes imperceptible variations and to question the reconstruction process that follows the earthquake. This project deals with movement and identity in the city, questioning our interaction with various spaces through an overlap of language and painting, sculpture and architecture. The exhibit is offered up for interaction and engagement – to be walked through, picked up, worn and imagined. A short presentation explaining some of the ideas underpinning the First Person Audio/Visual Urban Narrative approach, as well as the related research material presented in the exhibition. Followed by a brief tour of UCL’s immediate environs designed to explore the collaborative possibilities of the methodology. A dialogue between filmmaker Andrea Luka Zimmerman and writer David Roberts of Fugitive Images to discuss their long-term collaborative engagement filming residents of the Haggerston Estate. Discussion of the making of 'dalston fluxus' (5') - a continuous elevational portrait of Dalston High Street, originally commissioned for the London Cultural Olympiad 2012. Exploring the theatre of security: Henrietta Williams explains 'The Secret Security Guard', a photographic project based on fortress urbanism, private security and regeneration which resulted from her experience working as a security guard and x-ray screener during the London Olympics. The launch of Urban Pamphleteer issue #1, ‘Future & Smart Cities’. Each illustrated pamphlet in this series collates and presents expert voices, across disciplines, professions, and community groups, around one pressing contemporary urban challenge. The intention is to confront key contemporary urban questions from diverse perspectives, in a direct and accessible tone, drawing on the history of radical pamphleteering. For further information visit UCL Urban Laboratory. The City of Oikonomia aims at presenting the drawing of the plan as a sociopolitical operation that internalises rhetorical power through its drawn lines. It displays a collection of six central drawings, constituting a visual history of the Plan, paired with six different rhetorical tactics metaphor, metonym, synecdoche, decorum, ekphrasis and irony. By doing so, it proposes a drift in the role of plans from representation towards instrumentalisation, arguing that the modern plan becomes a technology for the administering, and eventually normalization, of the entire city. In this way, these tactical drawings ultimately question the fate of the plan and planning. Retracing the City - Mapping Plans, an accompanying lecture, aims to internalise the rhetorical power of the lines drawn in housing plans, using the exhibited plans to look at how the plan of the house becomes a technology for the administration, and eventually normalization, of the entire city. Angela Lasts DIY City Branding is an experimental public engagement project intended to provoke discussion about the branding of cities, iconographic skylines and privileged views. Visitors to the exhibition are invited to modify London skylines, as seen from exemplary privileged (tourists, luxury housing, corporate headquarters) and unprivileged (social housing) sites. Providing the option to chose from existing iconic buildings or to commission new ones, DIY City Branding draws attention to relations between image versus the experience of place and the use of architecture to create marketable identities. The installation is part of a wider project on democratic decisionmaking and urban space. Michel Serres term soft pollution describes the tsunamis of signs, images, and logos flooding rural, civic, public and natural spaces. Mireille Roddiers The Semiopathic City attempts to record the conflicting signifiers emblazoning the Parisian public sphere. It juxtaposes two series of traditionally Parisian imagery: the first is a series of overstylized touristic snapshots of typical Parisian faades. By exaggerating the pictorial compositions of Haussmanian details, the pervasive presence of global corporate logos comes to the foreground, as well as our general blindness to them. The second series presents a toponymic analysis of Parisian places, highlighting the lives and merit of those who most illustriously represent 2000 years of resistance to occupations. These two exhibits are accompanied by a presentation, The Image of the City, which discusses both the politics of representation (Roddier) and the democratisation of access to shaping the materiality and representation of the city (Last). Both projects consider the role of city branding, urban economics and the politics of tourism in overlapping ways. This joint talk discusses the roles of image and place, representation and experience, local and global metropolitan identities, from the prominent display of global corporate logos on the local vernacular to the use of architecture itself as icon of economic power. This exhibition represents the culmination of 4 years design research including writing, field work and design studio projects carried out in conjunction with the Bartlett Development Planning Unit's MSc Building and Urban Design course. Through the presentation of the Dharavi/Mumbai case study and the emblematic nature of its sociopolitical and sociospatial complexities from topdown redevelopment plans and bottomup resistance to the revelations of dynamic informal economies the exhibition reveals various phases of design investigation highlighting interlinked tools, methodologies and conceptual frameworks that attempt to reinterpret the notion of design principles and processes, pointing towards distinct yet complementary design actions for addressing a range of scales and interventions ultimately suggesting a critical reconfiguration of design practice. The city is increasingly generating a huge amount of data on various platforms including physical, mobile, digital and social ones and through various data sources such as GPS, Google Maps, Twitter, and Facebook. We show methodological and detailed explorations as part of the Module City as Interface on the MSc Adaptive Architecture and Computation. Moritz Behrens will give a talk and demo about the project Swipe I Like'. He will explore how we can enhance visitor engagement with museums through embedding a locationbased I like button which connects online and real world communities. Specifically, it will extend the use of Near Field Communication (NFC) technology to locate NFC card readers in cultural institutions, allowing visitors to simply swipe a card with an NFC chip to register whether they like an event, idea or place. This information is instantaneously transmitted to an online social networking platform and/or database for collection and sharing. The presentation is about the usage of images in shaping the built environment of Berlin since 1989. 'Reconstructionsim' is in fashion when it comes to architectural projects in Germany. The recourse of styles of the past is an old practice, but the exact photographic reconstruction of the outside appearance of a building is a new phenomena. The presentation focusses on the different roles images play in the act of reconstructing buildings, representing history and linking memories to the public space. Three main examples will be discussed: the Stadtschloss, the Berlin Wall Memorial at Bernauer Strasse and the citywide intervention 'destroyed diversity'. The city in its contemporary moment accepts the urban dweller as much an expert as the urban planner; the squatter as the architect; and the artist as the critic. Within the resultant network of interaction, Alliston and Weatherly posit their interdisciplinary collaboration in public sculpture as a mode of urban research. Elastic Subtle City evaluates conversation around work as one form of urban building, acknowledging the significance of discourse to collaboration and the city. Alliston and Weatherlys' drawings for their upcoming public sculpture in Londons Gordon Square are sited in the event of a conversation traced by their written correspondence. The artists will talk on public sculpture in relation to the their separate practices and the city at large. What promise does public sculpture offer to the continued making of the city at a historical moment in which participation beyond building and policymaking is proving key to social operations? And where does the microevent of the conversation stand in relation to the broader language moves of the macroevent that is citybuilding? Liz Rideal's artwork uses contemporary media and elements of abstraction to refocus our attention on St.Pauls. The coloured silks not only enhance the way that the building is perceived, they recapture particular parts of the structure possibly lost within the totality and represent them in a new and imaginative way. A lecture and Q&A on this and related work will elucidate the research underpinning the exhibit. Matteo Mellioli will talk about his work, Ghost Space, a visual representation of Venices soundscape, which leaves the viewer imagining sounds and far echoes generated by the canals and the lagoon while standing in front of San Marcos square. Discussion will focus on the importance of representing sound, its form and movement. Matteo Melioli is a London based designer, currently working for Zaha Hadid Architects on several art and performance projects. Matteo trained in Architecture and Design Theory in Venice, where he practiced on a number of historical refurbishment projects under the patronage of UNESCO. He subsequently relocated to London to enrol in a PhD program at the Bartlett. Today, Matteos main interest is in writing about design that engages visual and acoustic issues. This is the subject of his publications Sensorial Spaces: the Construction of Reality through Perception (2007) and Inhabiting Soundscape: Architecture of the Unseen World (2007). The essays explore the concept of space as it evolves in response to perception and phenomenology, cutting across the fields of architecture, music and the visual arts. Matteo's work explores the perceptual linking of seeing and listening, and the sculptural properties of sounds. In his drawings and graphics, Matteo represents the varying interplay of music, time and movement, unfolding the often imperceptible structure that binds sound and space together. When stating that listening to sound is something related to space, Matteo does not only mean that the sounds come from somewhere or that they fill a certain place, he wants instead to express the fact that these sounds are actual presences with their own specific spatial form, and this is not so much because the phenomenon unfolds in a certain space, but because it forms and creates a spatial dimension that Matteo aims to capture in his works. Matteo also presented his research at leading international conferences and symposia such as the Systems Research in the Arts and Humanities and the Architecture Music Acoustic where he engaged artists such Bernhard Leitner and Bill Fontana. In 2009 Matteo exhibits his series of printing Ghost Space at the cole nationale suprieure d'architecture de ParisLa Villette and in 2011 at the Serikawa Gallery in Tokyo. This project explores the contemporary vernacular portrayal of London by displaying text and images being created in and of the city, and uploaded to the internet, right now. The fragments displayed are drawn from the most recent uploads to various public databases (e.g. Twitter, Flickr, Instagram, Google). Our aim is to frame these new types of visual and textual vernacular representation in relation to one another, examining how they produce new understandings and experiences of the city on the ground, and how they operate as new forms of participation in London life. Event: Investigative research into radioactive waste on the Olympic Park site (discussion with Paul Charman and Mike Wells of Games Monitor, chaired by Julian Cheyne). The 2012 Olympic developments have devastated local light industry and contribute to landrent inflation across the area, accelerating the displacement of those on low incomes. Policymaking indicates a shift towards reflexive governance, a neoconservative turn. Games Monitor, a website dedicated to deconstructing the Olympic development process will be showcased, highlighting the multidisciplinary work undertaken by the core production group. A display board profiles an essay on the Games Monitor groups praxis, while photography projection will highlight the human resonance of displacement, and its negation in planning procedures and construction. A hosted discussion with Paul Charman and Mike Wells will explore the processes of investigative journalism, including the limitations of Freedom of Information legislation, and the detail of their investigations into the excavation and disposal of contaminated and radioactive soil on the Olympic Park site in Stratford. David Kroll will discuss the exhibit and will talk about the planning of the Minet estate, a Victorian housing estate in Lambeth. The study of the Minet estate is part of his PhD research on the planning and design of late Victorian and Edwardian speculative housing in London. The short film Tuzla: Energy Landscapes was shot in two weeks in October 2011 after urban researcher Vanesa Castn Broto was given funding to return to the Bosnian city where she has been doing research on local perspectives on pollution and environmental justice since 2005. The event will share specific details of the 2011 research trip with the audience and update them on the current debate. 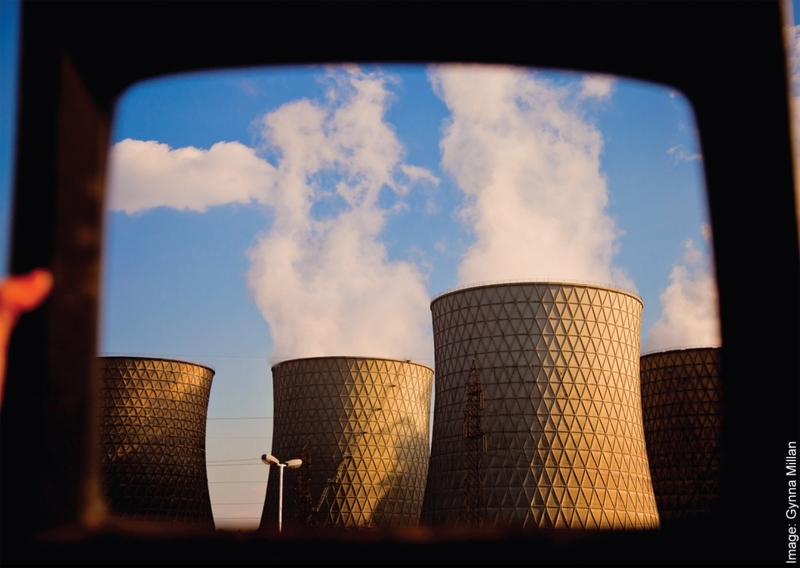 The film will then feature the previously inaccessible voice of the TEP (thermoelectric plant) in the debate and show images of the plants internal operations for the first time. An accompanying evening event will focus on the imaginative potential of examining notions of (specifically Olympic) Legacy through fiction and artistic practices making their way on a boulevard of questionably broken dreams and dystopian visions. Contributors to this discussion will include poets, writers and artist contributors to the book The Art of Dissent. The event will be filmed and the future visions conjured up throughout the evening later composited into a final film. This event will detail and discuss the innovative and critical practices Urban Studies MSc students at UCL developed and explored in relation to urban megaevents and festivals. Students will talk about why they chose particular approaches and how these have helped reconsider the interface between practice and urban theory. Practices ranged from filmmaking and fictionwriting, to the creation of postcards and bunting, and covered the 2012 London Olympics, Millennium Dome, 1951 Festival of Britain, 2014 Glasgow Commonwealth Games and the Notting Hill Carnival. The project investigates informal marketplaces in conflict zones, especially those on the doorsteps of political or infrastructural wherewithal. This exhibit presents the role, evolution, and current state of "Mingy Street" market, a thriving market living alongside the United Nations Interim Force in Lebanon (UNIFIL) headquarters' thirtyfiveyear peacekeeping presence in Naqoura, Southern Lebanon. Equal parts archivebuilding, architectural fieldwork and performative gesture, visitors are invited to select and project overhead transparencies from a curated dossier, presenting unmanifested futures and overlapping, elusive versions of Mingy Street and its inhabitants, asking viewers to speculate on the Unifil City that never was. The event will feature a talk on the research project that investigates informal marketplaces in conflict zones, especially those on the doorsteps of political or infrastructural wherewithal. Travel guides are a major source of information about cities, most of all for actual visitors. They are a vital resource for exploring how tourists are meant to understand the city. Based on a case study on East London this talk will demonstrate that the celebration of ethnic diversity in travel guides is embedded in economic contexts of leisure consumption and maintains ethnic boundaries. This event will launch a pamphlet and booklet that have developed out of the networks presentations and discussions. Firstly a pamphlet written by Andrew Harris and Louis Moreno, and designed by Adria Davidson, which emphasizes five points that can help reformulate and reclaim the notion of the creative city. Secondly, a booklet produced by William Haggard and Oliver Goodhall which opens up new questions about the parameters of regeneration policy, and the links between ethics, research, and practice. Am I Here is an artwork created collaboratively by the residents of the condemned Haggerston Estate in East London to challenge tabloid stereotypes and reclaim language that has defined social housing tenants. David Roberts will give a presentation on the methodological terrain of collaborative practiceled engagement. Painting an Alternative Masterplan is an 1hour Continuing Professional Development session (CPD) which will set out the rationale behind the production of painting as a design method. During this interactive training, you will: learn about alternative modes of visual representation of the urban environment; develop an understanding of painting as a research method; and become skilled in critically assessing your own design intentions. The session will provide reallife examples through the work Alternative Masterplan, which analyses the visual methods used to (re)present the current largescale redevelopment of Canning Town in East London. The projection appropriates the visual material produced as part of urban regeneration, while the painting proposes an alternative visual language that reflects the diversity of perspectives coexisting in an urban site. Do you ever read the books you burn? In the process of locating his 1966 adaptation of Fahrenheit 451, Franois Truffaut chose spaces as a simultaneous advertisement and critique of the new modern then situating itself within the postwar landscape. The project Fahrenheit 451 Displaced drives towards a new form of observing urban space, shifting the political charge present in Truffauts original locations towards the contemporary equivalent. Fahrenheit 451 Displaced presents a stack of papers divided by sixteen chapter titles derived from the original landscapes. These chapter titles in their deliberate ambiguity are designed to entice the audience subconsciously towards a new landscape, the modern equivalent of 1966. Each sheet bears an autonomous set of instructions, these being a painstakingly typed version of Truffaut's camera movements. The camera thus becomes the script and through the formulae of instructions, the audience the actor. The audience is invited to enter the landscape where they have displaced Fahrenheit 451, and act out the derivatives. Hence their bodies automation provide a new form for observation and critique of urban and nonurban landscapes. The audience is finally invited to submit text, sounds, images and film from their displaced derivs on the blog, (http://fahrenheit451displaced.tumblr.com/) in the drive towards archiving a multitude of subconsciously chosen and consciously visited landscapes, acting as a displacing of the film's original modernist concerns within the 21st Century landscape. ResonanceFM will broadcast landscape five, entitled Modernity's Home Comforts on July 10th and July 17th. Sponge Urbanism is a proposition for Detroit that projects a vision for an expanded field of land use and activities. The project tests how the remnants of an old, rectilinear, platted urban order can be transformed into a multidirectional, opencell, spongelike organization. The project operates through a manipulation of conventional drawing techniques: plan and perspective are combined with selective cutting, notation and diagram in a manner that encompass a variety of criteria to construct a view that, while impossible, establishes a means to simultaneously visualize critical elements cohering the sponge order. Conversation and presentations on 'Detroit, Newark and the post/exindustrial American city' with Tahl Kaminer (TU Delft, Edinburgh), Torange Khonsar (Public Works Group), Troy Schaum and Rosalyne Shieh. Recordings and Images are taken from the stairwell of Slade Research Centre. The project Residues explores the acoustic ecology of buildings. The focus lies on capturing the ambient sounds within a building, a sort of sonic waste emerging from the interior as well as the exterior, a collage of internal and external events. The recordings are made in movement by actively listening and exploring spaces with the microphone. They are then presented in form of a structured installation in a different space hereby joining two acoustic environments. Residues I - A Stairwell joins the sonic worlds of elevator and stairwell. The stairwell gathers the sounds of human movement together with an array of unnoticed sounds; Residues of street life, voices, electricity, pipes, birds, a car honking, echoes, leaves of trees, sirens, traffic, water dripping, wind blowing through keyholes and windows. This sonic waste is generally termed ambient. The elevator works as a listening post. By moving us mechanically it enables us to focus in on listening to this invisible acoustic ecology. This project is interested in the way that the city is remade through the performance of cyclists in London, with specific reference to the way that cyclists mobility patterns are affected by infrastructural preparations for the 2012 Olympic Games. Improvements in air, rail, and road transport are included in the typical sevenyear preparation period for an Olympics (mega)event, and the latter especially affects the placemaking and mobility practices, as well as the sensory experiences, of London cyclists. This project interrogates strategies of risk control used during the London 2012 Olympics by critically subverting tactics used by the Olympic Delivery Authority (ODA) themselves, such as public engagement, photoshopped imagery, and mapping. These are used to question the framing of risk: who or what is at risk, and who gets to define this risk? A public engagement process records concerns articulated by locals. From these an alternative set of maps are prepared. Some of these record invisible features such as security and surveillance. Others use innovative methods of mapping to record hidden power relationships such as those involving corporate sponsors. (in)Visible bodies: Migrants in the city of gold is a curated selection of three art projects produced by artists from and about the city of Johannesburg. The concept of migration (as the movement of bodies from one place to another) is used as a framework through which to rethink the complex interplay between what is rendered in/visible by the symbolic, economic, political and historic dimensions of the city of Johannesburg. The three works are 'Challenging Mud after Kazuo Shiraga' (2008) by Johan Thom, the Hilbrow/Dakar project (20078) by Hobbs/Neustetter and the Trolley project (2007) by Ismail Farouk. Once a derelict and contaminated site, Greenwich peninsula is a changing and contested landscape. Film, soundscapes and interviews are layered and juxtaposed to explore life on either side of the A102, a major dual carriageway the splits the peninsula into two halves. The combining and contrasting of these three mediums help to create a sense of familiarity and at the same time disorientation, mirroring what one perceives when walking around the peninsula. The film aimed to explore how a sense of place is being constructed by residents in an area that is being refashioned through regeneration and corporatization and the extent to which they are benefitting from these processes. By intentionally setting up the two sides of the peninsula against each other and overlapping additional aural information I became engaged in the construction of a new representational and dialectic enactment of landscape and place. This project addresses the social and spatial arrangements of displacement as performed by residents of contemporary Beirut. Twins try to realign their political positions and personal affiliations across urban space through decisions concerning where to live. It examines how residents internalize displacement as an act of passive resistance, contrasting the twin sisters decisions concerning where to live, through both poetic and violent spatial and visual strategies of representation. The project is poised at the time of about to, the moment before the swapping occurs, and focuses on creating spatial moments of twining and matching across visual horizons and through lines drawn on maps to reveal geographies of division and the immaterial borderlines of the city. DOMPOLY reframes political and economic conflicts associated with urban planning. Set in the context of the regeneration of the Greenwich Peninsula, two players compete for power and influence in the planning process. Both players take on fictitious positions a development company and a local community and aim at implementing a type of development that serves the necessities and interests of their gamecharacters. Through tactical play they can think through alternative processes and outcomes of regeneration. The game ends when the peninsula is fully developed. For this work I decided to make a one day journey walking from my home in Camden Road to a gas station in Battersea, taking photographs of every manhole cover of the street in order to symbolically follow the energy network that operates all over the city. They represent a limit within the city, a beneath system that is at the same time connected and disconnected, individual and collective. The photographs draw attention to the passing of the day and travel, to size and patterning, over a granted delimited space. This work aims at investigating the role of space in the act of the encounter with Otherness, as a catalyst for a radical social and cultural transformation of society. Between the Self and the Other there is a gap, in which the negotiation of identities, that allows processes of hybridization, takes place. This inbetween space is a space of threshold: the place where different worlds meet (Stavrides), therefore to dwell the threshold becomes the practice that allows the encounter with the Other. Border, Circle and Interstices will illustrate the spatial dimension of the act of dwelling the threshold. Finding Home documents our public research into local housing issues on Chatsworth Road, Hackney. For a week we occupied a disused Dentists, interviewing passersby about their experiences of housing. This forum was open to the public to inhabit, criticise and reflect upon. The research process itself became part of the dialogue with the locality, its vulnerabilities continuously exposed and its goals always under question. As an extension of this process, we invite you to occupy our seats, use our tools, read our research journals, listen to the recordings, browse the works that have informed our research, view images gathered throughout the project, and leave your own commentary, thoughts and responses. This exhibit/performance aims to challenge the dominant ideology of heteronormativity a regime of power based on heterosexuality as the natural way of being and taken as the blueprint of western social order. Born in such a social context, most nonheterosexual experiences are shaped by this ideology. In this exhibit we aim to bring out the relationship between space, experience and sexual identity in everyday London homes. Sitting in our domestic space and gazing through the viewmaster, an iconic childrens toy, we encourage the viewer to reflect upon the multiple ways heteronormativity influences everyday experiences of home, street and neighbourhood across different stages of life. The viewmaster is used here as a conceptual tool which comes to represent the tunnel vision of heteronormativity. The triangulation of the gaze, viewmaster and the homely images aims to reproduce the power relation between the viewer and the viewed. Although some of these images from our respective research projects may look like your home, or any typical home in London, we argue that it is the social normative context within which these homes are set in relation to alternative lifestyles that nonheterosexuals queer domesticity. Hence, we argue that the meaning of a queer home needs to be understood within a holistic cultural context. Brent Pilkey is a doctoral student at the Bartlett School of Architecture, UCL. He has completed an Honours Bachelor of Arts in architectural design and art history as well as a Master of Arts in art history at the University of Toronto, Canada. His research, funded by a UCL Overseas Research Scholarship, looks at the queering of domesticity in London. Rachel Scicluna is reading her doctorate in social anthropology at The Open University where she was awarded a Charter Studentship attached to an ESRC funded research project. Her background is in social and medical anthropology where she completed her Masters in medical anthropology at The University of Sussex. Her PhD looks at the meaning and ontological experience of the kitchen from the perspective of older lesbians. Last year the City of London Corporation launched a campaign, Green to Gold, in an attempt to get more people involved in sport and activity with one year to go to the London Olympics. Its aim was to engage and inspire communities to use open spaces for positive recreation. Green to Gold transforms the image of an open green space into a pulsating gilded geometric form. It is part of a series of temporary installation works that deal with the overlap and associations between memory and place and allude to the poetic possibilities held within a landscape in which inner and out vision are reconciled. The work also refers to the golden coffer ceiling paintings by Veronese in the Cheisa di San Sebastiano, patron saint of sport and athletes, in Venice. The displayed video depicts a cyclists eye view of Elephant and Castle, an area of South London currently undergoing substantial redevelopment. As the cyclist passes through, images from architects proposed streetscape changes have been inserted into the videos top lefthand corner. The same video was shown to focus groups, and selected excerpts are displayed here. These discuss the social connotations of urban forms, but also allow an exploration of how the lived experience of area differs from and relates to the medium of video as a contiguous linear series of places.